So, my pattern is likely to be in the next issue of Magknits. That’s fine – it was alway likey that it would be the March edition. However, after reading Kerrie’s recent blog entry about people just complaining and making personal attacks, I’m not sure I’m ready for this. 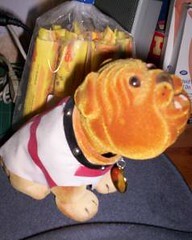 Hopefully, nobody will notice my pattern, no-one will make it and I’ll be able to live peacefully and quietly. Except, I’ve got another pattern that will be in the June issue (swatch below) that I’m assuming will get more interest. :sigh: What have I let myself in for? I love the way the colours pool on in the heel flap. 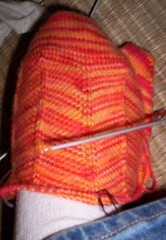 I’m only doing a short sock, so I should be finished in the next week (!). 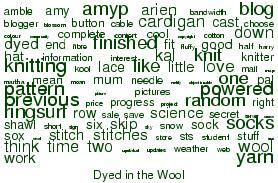 The next clue will be what the yarn is! Does anyone know of a clean, easy, cheap and legal way of getting rid of noisy neighbours? I’ve just about had enough. Blegh. Right – I’m off to email my tutor with my idea for my project report on the prevention of HIV transmission from mothers to babies. Edited to Add: Oh – I completely forgot – I’m going to be a cousin! My uncle got married at the end of last month and in six months time, he’ll be a dad (you can do the maths, I think!) The little girl will be half scientist, half accountant. I think we’ll get on just fine! And it means I’ll finally get a real baby I know to knit for! Yay! The Knitting Olympics – are you kidding! I have enough self-imposed pressure, without any other kind of deadline thank you! 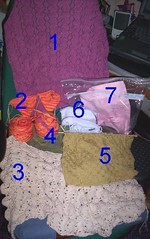 Any kind of sock exchange – see my previous effort for a reason why. Knit Alongs that I have no realistic expectation of starting, never mind finishing. Rogue – I will cast on for this as soon as I’ve finished erm… I Do? Martha? More published patterns – there is one for definite (Magknits again) and I have an idea for another that I’m currently working on. A shed-load more socks – my aim is to alternate a pair for me and a pair for my mum, but we’ll see how well that works out! I’ve not been well for over a week and a half now and as a result I’m averaging two rounds every 30 minutes at the moment. Coupled with the gusset increases it makes for slow going. This means it’s not looking likely that I’ll be finished for the prize-draw in the KAL (14th of Feb), but that’s not why I joined in the first place anyway. 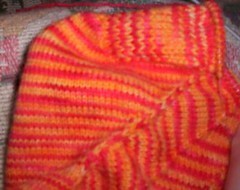 I have another 12 rows to go before turning the heel, and that always goes (relatively) quickly. Progress has halted for a while, but as soon as I finish Jaywalker, I’ll get going again. Whilst I’m not able to knit I’m designing – either on paper or in my head. I’m currently working on two definites- one for Magknits and another for an as-yet-undetermined location. I don’t have the yarn for the Magknits item yet, so it’s all calculator and guess-work for the time being. I’ve not had word from Kerrie yet as regards the publication of my already-done item, so I’m assuming that it will be in the March issue. Or it could be that between her proper job, Hipknits, Magknits and two sick kids she hasn’t has a spare nano-second! Poor woman! ETA: I forgot to mention this – if you have a spare moment, just pop over to UKnitty and leave your best wishes to “C”. She’s in hospital at the moment, and her boyfriend posted a message letting us know. She’s been supportive of my Arien-designing process (and my Welsh)! I promise not to buy any more sock yarn until I’ve used (almost) all of my stash up. I reckon that’s about 20 pairs of women’s socks assuming I use all the left overs. I promised that I’d put the Airen pattern up. Oops! I can’t understand my own notes and I can’t even find out how many stitches I cast on. I can always scan the bits of paper and put them up so everyone can interpret them? I promise not to buy any yarn of any kind until I’ve made all the stuff that I already have yarn and a pattern for (that’s another list for another time!). Unless it’s for a present, of course! I’m not too sold on the toe. It’s a bit pointy for my toes. Guess who’d they be perfect for – my mum! She ain’t havin’ them! I had a bit of a cruddy birthday. I was woken up at a quarter to three when my drunk, diabetic, 16 year old next-door neighbour came home and started shouting “I WANT MY PHONE!” over, and over again. And then, in the evening, I was told that my grandpa has had cancer for three and a half years. You know how people say they were knocked side-ways with bad news – well, if there hadn’t been a wall in the way, I’d have fallen over. I’m still working on deciphering my notes (really, really should have paid attention to what I was doing) and I should have something semi-concrete by Saturday. Well, I think I can call that random Thursday! See y’all on Saturday then! 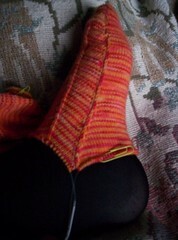 Details on how to do that are found in “Cool Socks, Warm feet” by Lucy Neatby (a book I got for Christmas). 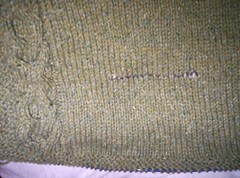 I’m about 2.5cm (1″) from the gusset increases. For comparison, I’ve laided it on my “Star Trek” socks. My course is set to start in earnest in a few weeks, although the work load will be no where near as heavy as last year. this means I should be able to do a lot more sewing. With that in mind, I’ve got myself this pattern, from Simplicity. It’s from the Khaliah Ali Collection, and it’s designed for women like me (super curves!). 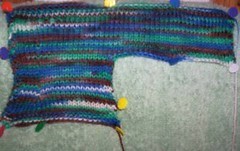 In knitting-knews, I plan to pick up the Sirdar lace cardigan and get going on that as soon as I’ve finished mum’s cardigan. Look for the showcase of the finished Arien cardigan (notes and caveats will follow a few days after that).